Flint Marko's redemption was something I really liked, and I wish more had been done to establish him as a true hero afterwards. Instead he seemed to cross back and forth over the line between hero and villain in the decades that followed. I confess that I have lost track - I'm not sure what his status is these days. Heh! For all I know, he and Hydro-Man fell for each other, and went back to being a macabre mud-thing! T minus twenty issues and counting. I loved Sandman as a hero. It was daring and very interesting to see such a classic villain become something better only to have it become a spiritual burden . While I liked his stint in the Avengers, he was best in the Wild Ones (Silver Sable's bunch). I think he would have been great in the Exiles too. I think Sandman would've worked out well in the Thunderbolts once Zemo revealed the truth. 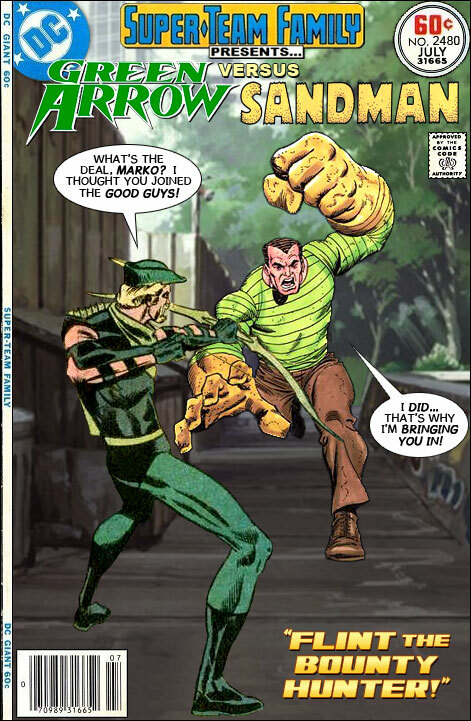 I think adding him to the line up, w/ Hawkeye, and maybe Prowler another reformed thief. He died. Sort of. He said his human body died, but he lived on as sand. He's more Sandthing than Sandman, now, but is on good terms with Spider-Man. There is no land beyond the law. Where tyrants rule with unshakable power! 'tis but a dream from which the evil wake. To face their fate, their terrifying hour! That poetic little trademark always made me wonder if Dr. Fate and Hourman ever sued for royalties. Writers cannot seem to allow villains to reform although they have no problem leaving heroes who used to be villains (i.e. Hawkeye and Black Widow) as heroes. I really liked Crusher (Absorbing Man) with Black Bolt especially after series where you see how much respect he had for Captain America; if things had been different he'd had been at least an anti-hero. Maybe Ross needs a new group. League of former Super-Villains. Loved when Sandman was an Avenger. There was so much potential there. And his bar room chat with Ben Grimm is a classic. I loved it when Spidey threatened Sandman with the Queen of England's own Hoover carpet sweeper, just so they could get a flight back to NYC--and board it--on time!